Welcome to New Earth: New Earth products are all natural, organic nutritional supplements made from powerful whole Super Foods. Welcome to www.naturalvitaminproducts.com, this website belongs to Scott Singleton, New Earth Associate. 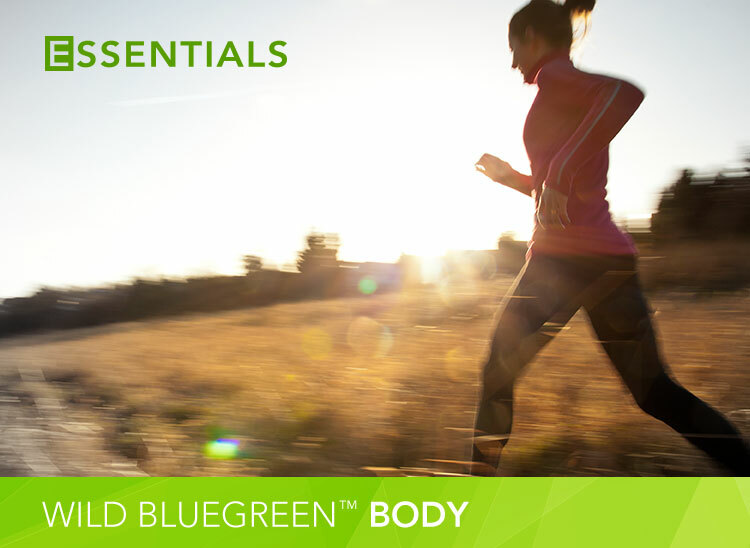 Wild Bluegreen Algae, pure food enzymes, and powerful probiotics. 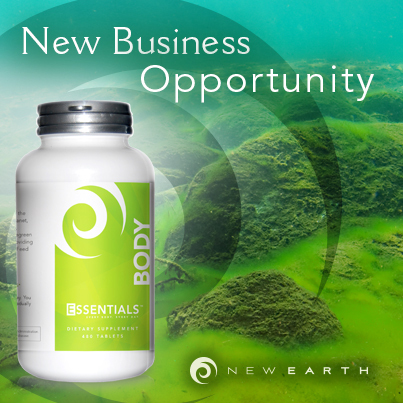 New Earth Essentials provide the building blocks to a healthy digestive tract, optimal nutrition, and vibrant health, for everybody, any age and lifestyle. Feed your body the best food on earth. New Earth’s Wild Bluegreen Algae is one of the most profoundly nourishing foods on the planet, rich in a wide spectrum of phytonutrients, plant-based proteins, minerals, and essential fatty acids, and other micronutrients. It is also an adaptogen, meaning that it supports the body’s ability to resist stress, normalize itself, and to bring things into balance or homeostatis. Get your core ESSENTIALS products in a month’s supply of convenient daily packets, ready to slip in your pocket or purse and take with you anywhere. Thanks for your interest and visit to our website. Please let us know how we can help you by using the contact form below. You may include questions, comments, or let us know if you need information for a nutritional product, about the company, or income opportunity. We will be in touch with you as soon as possible. Thank you! The New Earth logo, trademarked names, phrases and images are used with permission from New Earth. This is a New Earth Independent Associate website. These statements have not been evaluated by the Food and Drug Administration. These products are not intended to diagnose, treat, cure, or prevent any disease. The New Earth MLM Company officially launched in September 2013 and has quickly become one of the premier network marketing business opportunities in the health and wellness industry. 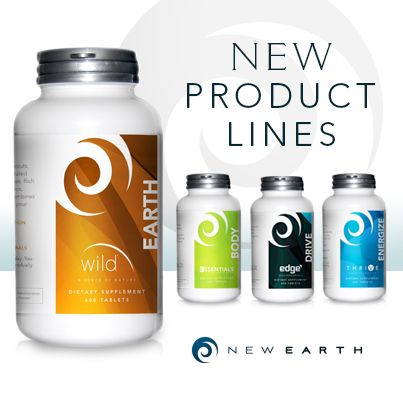 New Earth Products are natural, organic dietary supplements that combine the best of science and nature. New Earth health products are crafted from premium whole wild superfoods, Earth's First Foods such as blue green algae and mushrooms. Our products are scientifically designed to meet the needs of every system in your body. The whole wild superfoods from nature can nourish and protect your body in different ways. Browse and shop for New Earth products at the New Earth Store - New Earth Shop. You will notice that our nutritional supplements and health products may impact your energy, mood, digestion, sleep, mental clarity, athletic recovery, and may enhance your overall health and well-being. * Here are the primary New Earth product categories: New Earth Essentials, New Earth Wild, New Earth Edge, New Earth Thrive, and New Earth Give. Please take some time to read the New Earth product labels, New Earth Foods, and check out our natural food supplements at the New Earth Market. New Earth Supplements are certified Kosher, Halal, USDA Organic, and are manufactured on-site, using the highest standards of NSF Good Manufacturing Practice and GMP for Sports. Try A New Earth natural product and experience the health benefits that many have achieved with our organic nutrition supplements and dietary supplement tablets. New Earth, first and foremost is about exceptional health products that promote a stronger and healthy body, mind, and spirit. Over the last few decades there has been a significant trend in healthful eating and organic whole foods. The demand for wild food products like edible algae and mushrooms is exploding! Organic foods, dietary supplements, and wild whole food consumption is pumping billions of dollars into the industry. Whole wild superfoods is a growing trend that is providing massive opportunity to the nutrition and health industry leaders. Learn more about New Earth Superfoods. The primary component of New Earth superfood is wild microalgae harvested from Upper Klamath Lake in Oregon. A diet rich in superfoods has been found to promote athletic performance, muscle recovery, energy, stamina, and increase metabolism. You can take advantage of this business opportunity by participating in the New Earth Home Based Business. The network marketing industry is booming and expanding at a rapid pace even though the economy remains flat. People want what New Earth offers: quality nutritional supplements made from organic superfoods, and a business opportunity that is on the cusp of a major trend and growth cycle. Welcome to New Earth Network Marketing. The New Earth Business Plan is backed by quality products, leadership, compensation, and sustainable growth. What's the New Earth story? The New Earth founding principles and mission is centered on Live, Give, and Grow, go here to learn more: New Earth Live and New Earth Grow. What do you like about New Earth and are you ready to get started? If so, go here for New Earth Enrollment - Join New Earth. Or, talk to a New Earth Health Coach to get more information about the New Earth business opportunity, New Earth products, and New Earth home based business plan. Make sure you subscribe to receive the New Earth Newsletter, New Earth Reach. Team New Earth is a brand new MLM opportunity in the network marketing industry. Learn more about New Earth and get your invitation to enroll in their new MLM prelaunch. BioAgile is a new product within the EDGE Peak Performance natural supplements line, NSF certified, and available only from New Earth. Stay tuned to this website to get the latest news about New Earth BioAgile! Get ready to taste the all natural BioAgile shot, for physical performance, physical activity, recovery, renewal, cognitive support, and brain health. New Earth Life Sciences is a company and a community of innovative leaders, who are caring, passionate, and dedicated to excellence. The New Earth Team of network marketers and home based business associates are among some of the most successful business professionals in the network marketing industry. Here are just some of the top MLM leaders who have partnered with New Earth: New Earth - Scott Singleton, New Earth Richard Kall, New Earth Rob Hawthorne, New Earth Robert Hawthorne, New Earth Mike Raiche, New Earth Ana Gabriel Mann, New Earth Ana Mann, New Earth Jeff Gardner, New Earth Barbara Swanson, New Earth John David Mann, Katharine Clark, Susan Rispoli, and New Earth Donia Al Alawi. Here are some of the New Earth team representatives and leadership: Ana Gabriel Mann, Susan Rispoli, Barbara Swanson, Ilyse August, Charles Leslie, Kevin Larson, Bilal Ruknuddeen, John David Mann, Ana Gabriel Mann and New Earth Life Sciences, Susan Rispoli New Earth, Charlotte Carreira, Janna Chandler, Willow Star, Bucky Dent, Yankees baseball, Steve Gagne, Dr. Jeffrey Bruno, Donia Alawi, Alan Joel, roberthawthorne.com, Steve Zarren, Madalyn Ward, Scott Ohlgren, Hannah Ineson, Madison Burgess, Joe Furcinite, Eckhart Tolle, and Michael Bolduc. 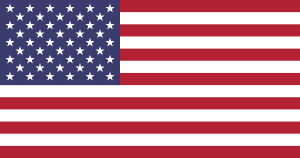 Currently, the New Earth business opportunity is available in all areas of the United States, with active network marketing groups in California, Florida, Texas, New York, Oregon, Washington, San Francisco, Los Angeles, New York City, NYC, Seattle, Chicago, San Diego, Boston, Washington DC, Portland, Atlanta, Houston, Phoenix, Dallas, Denver, Orange County, New Earth California, New Earth Texas, New Earth Florida, New Earth New York, New Earth Maryland, New Earth Illinois, New Earth Pennsylvania, New Earth Ohio, New Earth Georgia, New Earth Michigan, New Earth North Carolina, New Earth New Jersey, New Earth Virginia, New Earth New York City, New Earth Los Angeles, New Earth Chicago, New Earth Dallas, New Earth Houston, New Earth Philadelphia, New Earth Miami, New Earth Atlanta, New Earth Baltimore, and New Earth San Francisco. Is New Earth coming to your area? You could become one of the first New Earth business associates in your country and be on the ground floor in your region of the World. We're looking for people just like you in places like New Earth Japan, New Earth China, New Earth Brazil, New Earth Mexico, New Earth France, New Earth Malaysia, New Earth Russia, New Earth Germany, New Earth UK, New Earth Columbia, New Earth Taiwan, New Earth Italy, New Earth Thailand, New Earth Venezuela, New Earth Canada, New Earth Argentina, New Earth Australia, New Earth India, New Earth Phillipines, New Earth United Arab Emirates - UAE, New Earth Dubai, New Earth Europe, New Earth Asia, New Earth United Kingdom, newearth.us, and New Earth International. New Earth natural health products are gaining popularity in Hollywood, Beverly Hills, Burbank, California, CA, FL, LA, DC, MD, South Beach, Miami, Orlando Florida, Tampa Florida, Boynton Beach Florida, West Palm Beach Florida, Boca Raton Florida, Fort Lauderdale Florida, Washington D.C., Portland Oregon, Denver Colorado, San Francisco California, San Diego California, Seattle Washington, Boston Massachusetts, Atlanta, Philadelphia, Las Vegas, Virginia Beach, Canada, British Columbia, Vancouver, Toronto, Montreal, Ottawa, Victoria, B.C., University, and college campus locations across the United States. Film and television industry, models, actors, dancers, actress, TV personality, athletes, modeling, and other entertainment talent are discovering the benefits of New Earth blue green algae and organic health food products. You may have heard about New Earth in Natural News - naturalnews.com or Nutraceuticals World - nutraceuticalsworld.com, or more likely you were introduced to New Earth by a health coach, at a health studio, college, or through a conversation with someone who is familiar with the New Earth Co. New Earth products are acclaimed for their purity, quality, raw, organic, and natural food ingredients that provide optimal nutrition for best health. Find out more about the New Earth Community, and check out the awesome testimonials from members of the New Earth Team! Are you looking for a ground floor health product MLM, a natural MLM, with a great unilevel compensation plan? The New Earth business opportunity is the place to start. This New Earth website and content is related to some of the following topics: newearth, blue green algae, Team New Earth, New Earth, new business, new MLM, vitamin, vitamins, health products, natural vitamin products, blue green, spirulina algae, wheatgrass, natural vitamin, organic vitamin, dietary supplements, algae, mushrooms, superfoods, whole wild foods, whole food supplements, super foods, new earth protein, new earth energy drink, new earth organics, new earth superfoods, health food store, network marketing, business opportunity, prelaunch, new earth online, new earth video, new earth company, new earth business, new earth, new earth products, new earth opportunity, independent associate, new earth store, new earth life sciences, new earth university, eatlight, peak performance, new earth support, wild naturals, natural superfood diet, spirulina benefits, spirulina health benefits, spirulina algae, whole food supplements, gluten and gluten free, simplexity, simplexity blue green algae, simplexity health, new earth online, whyalgae.com, newearthco.com, edge natural fitness, sport daily renewal supplement, NSF certified for sport, 2oz liquid shot, cognizin, citicoline, green tea, wild microalgae, eleuthero, siberian ginseng, sustamine, glutamine, alanine, ribose, leucin, New Earth Protein, Eat Light, Healthyfuture, Organics on the Go, healthyfutures.net, Crossfit Supplements, Natural Supplements, and Workout Supplements. New Earth supplements are also commonly associated to the following health categories: health products, natural health, natural vitamins, organic supplements, blue-green algae, AFA algae, aphanizomenon, Natural Products Association, Natural Life, Earth's First Foods, algae supplements, probiotic supplements, mushroom supplements, health revelations, whole food supplement, wild essentials, foods that give you energy, nsf certified, and stem cell nutrition. About algae, algae food in the form of aphanizomenon flos-aquae is an edible micro-algae that offers powerful health benefits. 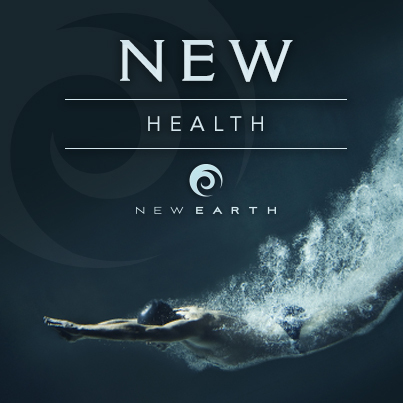 New Earth is the new Algae Company providing health benefits such as: nutrition, health, integrative nutrition, and wellbeing. * New Earth blue green algae supplements and the New Earth products catalog offer a range of items that enable the individual to improve their health and wellness. New Earth is the original Algae Company. Learn about the home-based business opportunity with New Earth Co. Check back here to see news about our new launch of an all natural energy drink product that will provide unique health and sports related benefits for individuals engaged in athletics, exercise / fitness, health coaching, strength training, recreation, aerobic or endurance events. You will enjoy the New Earth drinks as a sports nutrition product containing superfoods and natural ingredients with no artificial preservatives. Are you interested in Natural Health? Did you know that natural superfoods provide optimal nutrients for your body and mind? For good health, you must focus on nutrition. Nutrition provides the nourishment of essential vitamins, minerals, and other elements that strengthen our immune system and enable our internal organs to function better. * Nutritional deficiency could lead to serious health issues. Eat nutritious foods and use New Earth natural health food supplements to strengthen your body and mind. See below for more information about New Earth Co products. New Earth network marketing prelaunch is gathering momentum as a new MLM giant in the health and nutrition industry. New Earth offers a full line of health and nutritional supplements created from natural organic and wild whole superfoods. One of the New Earth products is designed for sports performance, and for people who exercise at a moderate to high intensity. Athletes and avid exercisers will really likeNew Earth Edge, for Peak Performance, energy, power, endurance, and aiding the recovery from exercise. Get your athletic EDGE with whole superfoods. Whether you scale mountains, hit the gym hard, or simply lead a jam-packed high-stakes life, our active lifestyle products will give you the EDGE you need. Crafted from Wild MicroAlgae and tonic mushrooms in synergy with bee pollen, gingko, eleuthero (Siberian ginseng), turmeric, and other whole natural superfoods, EDGE supports your performance and recovery. * The product names alone tell you the whole story: Drive, Focus, Rebound, Flex, Build. Boost performance and physical capacity, Sharpen clarity and improve reaction time, Combat cellular oxidation and accelerate recovery time*, and Promote joint health, flexibility, and range of motion. For more details about the New Earth nutritional products, go to: www.newearth.com/ScottS a New Earth Independent Associate website. These products are not intended to diagnose, treat, cure, or prevent any disease. BioAgile, a new daily renewal supplement, all natural, in the liquid nutrition category. The new liquid shot is an all natural supplement providing health and performance benefits, nutrients, energy, and recovery after exercise. KLAMATH FALLS, OREGON, UNITED STATES, /EINPresswire.com/ -- A New Earth Food and Natural Health Company (New Earth Co.) of Klamath Falls, Oregon announced details about BioAgile: a new daily renewal supplement in the liquid nutrition category. The new liquid shot is an all natural liquid supplement that provides health and performance benefits, increased energy level, nutrients, and packs a powerful physical and mental boost. The BioAgile liquid nutrition supplement is a one-of-a-kind natural health product with all natural ingredients: cognizin, sustamine, organic wild microalgae, vitamin D, ribose, leucin, blueberry, citrus, and other all natural components. The liquid shot contains no added sugar, no GMO, no artificial sweeteners or colors, no energy crash, and only 26 calories per serving. Look good and feel good with our new All Natural Nutrition Supplements made from organic and wild superfoods. Power your body and mind with the pure and natural health food supplements from New Earth Natural Health. The Best Superfood to include on your diet. Superfoods are called "super" for very good reasons: the foods are rich in nutrients and especially beneficial for our health and wellbeing. Sometimes referred to as "nutrient powerhouses," you can expect superfoods to have a wide array of antioxidants, polyphenols, vitamins, and minerals contained in them. The long and short of it is, adding more of these to your daily lifestyle reap huge healthy returns. At New Earth, we're proud to say we feature over half of these top superfoods in the products we create and promote. To learn more about New Earth's products—and the superfoods we use in them—visit Why Science Matters and http://www.newearth.com/ScottS/Products. Newearth wellness products and superfood nutrition supplements are made from natural ingredients such as blue green algae, wheat grass, green tea, turmeric, flaxseed, kelp, and other wild whole foods providing essential nutrients. Some of the most common questions about New Earth blue green algae are about spirulina benefits, where to buy blue green algae, and in general, what are the health benefits of using New Earth supplements. There is a significant amount of information about the benefits of superfoods, and specifically: green tea benefits, turmeric benefits, wheatgrass benefits, flaxseed oil benefits, and spirulina health benefits. Newearth.com is the premier company for blue green algae originating from Klamath Lake in Oregon. Go for vibrant health, well-being, and natural foods with New Earth Life Sciences. We’re a lot of things. We are algae. We are fungi. We are 100% all natural. We are probiotics and superfoods and a whole lot more. Perhaps most importantly, we’re committed to helping others live richer lives. We help fuel them with the very healthiest, most nutritious products we know how to deliver. 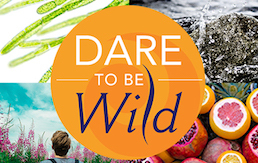 Organic, wild and raw, Wild Essentials offers the elements of nature unleashed. Want to give your body the goodness it deserves? How about better immune function, better cardiovascular health, digestion and mental health? How about adding cellular renewal, prevention, and natural healing to that? Because we’d like that for you, too. We’re here to help. We’ve been doing this a while. Thankfully, we’ve learned a thing or two from what this world has taught us. Introducing EDGE Natural Fitness. Learn about our the EDGE Recovery supplement. Here is your natural solution to increased energy and recovery. All Natural product for performance and renewal. High quality protein source. Perfect for heavy workouts, endurance, strength, and fitness. Ideal for athletes, crossfit, mixed martial arts, or any gym or health club member. Ask for EDGE products = Get Results and Peak Performance! New Earth Science, New Earth University, New Earth Studies, New Earth Events, New Earth Blog, New Earth Testimonials, New Earth Contact Us, New Earth Algae, New Earth Mushrooms, New Earth Business Plan, New Earth Klamath Lake, New Earth Health, New Earth Full Spectrum Probiotic.